Our flagger training and certification course is approximately 5-6 hours. Upon completion you will be issued an ATSSA 4-year certification. The flagging certification course is designed to teach the skills necessary to individuals who work in the construction field as a flagger, and to those interested in becoming a flagger. By the end of the flagger training course, participants will have the understanding and fundamental principles of flagging techniques and procedures. This flagging certification is also required to work as a pilot car driver. Flagging classes are offered throughout the state of Alaska. Start a new and exciting career today, don't delay! 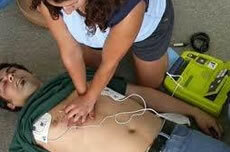 Our CPR/First Aid/AED training and certification course is approximately 4-6 hours. Upon completion you will be issued an American Red Cross 2-year certification. Would you know what to do in a cardiac, breathing, or first aid emergency? The right answer could help you save a life. With an emphasis on hands-on learning, our CPR/First Aid/AED course will give you the skills to save a life. Work Zone Traffic Control & Maintenance's CPR/First Aid/AED course align's with OSHA's Best Practices for Workplace First Aid Training Programs, and is available in classroom and blended learning formats. Your 2-year certification includes CPR Adult, Child & Infant , First Aid and AED. Be prepared when Every Second Counts! Classes fill quickly! 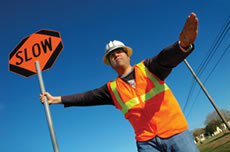 Call Work Zone Traffic Control & Maintenance today for preregistration.